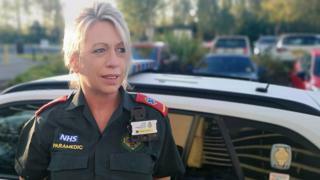 About 40 frontline staff, including paramedics, will take part in a three-month trial, the North East Ambulance Service (NEAS) said. Cameras are necessary to help "ensure the safety of employees" amid rising reports of violence, the trust said. A decision on whether to extend their use will be taken after the trial. Alan Gallagher, head of risk at NEAS, said it is working with police and other partners after reports from staff of "more incidents of aggression and violence." Mr Gallagher added: "From previous reports, we know that most of these incidents happen away from CCTV covered areas, so using body-worn video cameras will mean that our staff can record evidence of abuse or assaults when they happen, such as when they are in a residential property attending to a patient. "This move is designed to help us bring more prosecutions against people who put our staff at risk and reduce the assaults and abuse they are currently facing in the line of their work. "There really is nothing more disheartening than being hurt by someone that you've gone to help, particularly when they already work in such challenging circumstances." The trust also said the number of areas flagged as potential violence hotspots was increasing. Mr Gallagher said: "We hope that by providing credible evidence where we can, courts might be able to be much tougher when sentencing those found guilty of assaulting and threatening our staff."